New York City—the city that never sleeps—draws in more than 60 million tourists each year. And luckily, if you're planning a trip, there's no wrong time to visit. 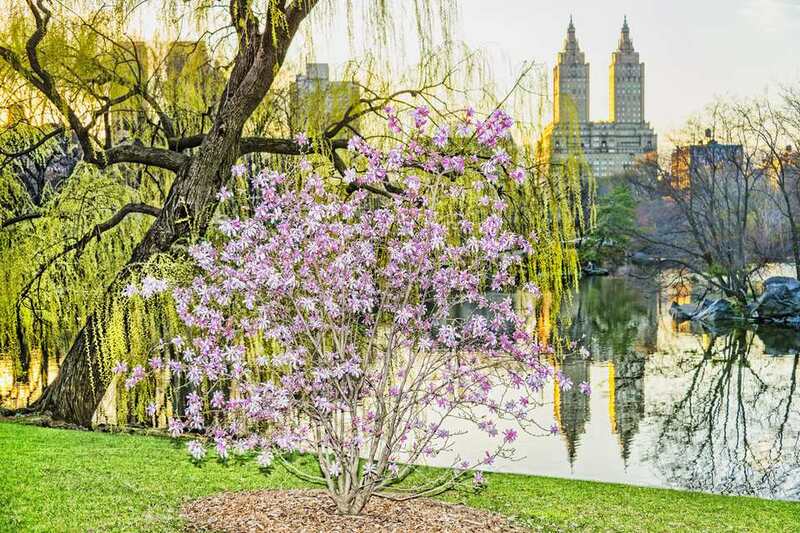 Whether you're hoping to enjoy the spring weather in Central Park or admire the giant Christmas tree at Rockefeller Center, the city has something to offer visitors in all months. Having said that, if you're hoping to balance great weather, special events, and minimal crowds, the best time to visit New York City is in May. The warm weather lures both residents and visitors alike to flock to green spaces the Highline, and Bryant Park, to participate in a New Yorker's favorite pastime: people-watching. Picknicking in the parks is also a favorite hobby of locals, and you'd be hard-pressed to find Sheep's Meadow in Central Park without blankets, beverages, and charcuterie on any given Saturday or Sunday. There are also plenty of things to do in New York City this month, but, fortunately, you will most likely miss the throngs of tourists that invade the city's most popular attractions in the summertime. You should keep in mind though, that while crowds tend to be minimal in late spring, Manhattan is just one tiny island, so don't expect to have the city all to yourself, no matter the time of year. Given its size, New York is home to many significant events and festivals throughout the year. The city also has several sports teams that call it home. Among the most popular annual events held in New York each year are the Village Halloween Parade, SummerStage, a concert series held in Central Park from May through October, April's Tribeca Film Festival, and the Rockefeller Christmas tree lighting ceremony each November. January is frigid, with many city residents electing to flock to wintry escapes in the Catskills or to fly south to warmer temperatures in Miami and the Caribbean. If you chose to visit, you'd find reduced rates for hotel rooms during this month. The No Pants Subway Ride is a quirky annual event that involves thousands of New Yorkers riding the subway in their underwear. It's typically held in mid-January. If you think you handle cold well, why not join the Coney Island Polar Bear Club for an icy dip in the Atlantic Ocean? Weather in February can be extremely unpredictable, with a blizzard one day and balmy, spring-like temperatures the next. Chinese New Year is the biggest February holiday in New York. Festivities include a massive parade through Manhattan's Chinatown. Save money on often-pricing New York City dining by taking advantage of Restaurant Week. Many of the city's best restaurants offer discounted prix fixe meals. Temperatures warm up a bit by March, but a late-season snowstorm isn't unheard of! The end of the month is a popular time to visit, as many students are out of school for spring break. The Armory Show is New York City's most prominent art fair. Hundreds of dealers and gallerist showcase their work. New York's St. Patrick's Day Parade is among the largest anywhere. It's been held since the 18th century. By April, you can expect tulips and outdoor cafés to have re-opened. Watch out for spring breakers, though! Rub elbows with movie stars at the Tribeca Film Festival. The festival usually takes place in late April through early May. Easter in New York is a festive and colorful holiday, thanks to the city's parade. Many hotels and restaurants offer special Easter brunches on this day. May is an ideal time to visit, as temperatures are typically fully warm during this month. There can occasionally be thunderstorms and bouts of higher temperatures, but it's not nearly as hot as July or August. Also, kids are mostly still in school, so crowds are manageable. If you like men in uniform, you will see an influx of sailors flood the town during Fleet Week, held in late May. Sailors often offer free tours of their ships that are docked in either Manhattan or Staten Island to patriotic visitors. Watch over 32,000 people ride together during the TD Five Borough Bike Tour in early May. Operated by a nonprofit organization, this event aims to promote and encourage bicycle safety through community outreach, and large events. During summer, locals and tourists alike flock to the city's green spaces and the city begins to swell with visitors. There are numerous outdoor events and festivals in June. NYC Pride is one of the world's biggest pride celebrations. The five-hour parade is held on the last Sunday of the month and celebrates all LGBTQ-identifying people. Coney Island's Mermaid Parade is a glitzy, glamorous affair in which mermaids and other sea creatures (or people dressed like them, at least) parade down the Coney Island boardwalk. July is a busy month for tourists in New York City, as kids are out of school and many Europeans are on holiday. Many locals head to the beaches on Long Island or the Jersey Shore as a respite from the sometimes sweltering temperatures. Spend some time outdoors at a local baseball game. You have not one but two major league teams to choose from—the iconic New York Yankees, who call Yankee Stadium (located in The Bronx) home, or the Mets (short for Metropolitans) the play at Citi Field (located in Queens). Fourth of July fireworks are a big deal in New York City. The best show takes place off of barges situated along the East River. August in New York is usually hot, hot, hot. Luckily, there are plenty of indoor activities and events to stay cool (the Met, anyone?) and for those who can stand it, lots of outdoor fun as well. Summer Streets is a beloved event that takes place on Saturdays in August. For three Saturdays, Park Avenue is closed to car traffic and open to walkers, runners, and cyclists. The Jazz Age Lawn Party is a summertime tradition on Governor's Island. Dawn your best flapper apparel. Labor Day marks the city's transition from summer into fall. Crowds die down during this month and temperatures usually drop by the second half of September, making it a nice time to visit. Electric Zoo is a popular electronic music festival held on Randall's Island. Many international DJs and bands have headlined the event. The San Gennaro Festival takes over Little Italy for 11 days of food, fun, and plenty of good eating. The event's been held for more than 90 years. Leaves begin changing in October, and the weather is full-on fall-like. In addition to May, this is one of our favorite times for an NYC visit due to great weather and light crowds. Comic-Con, held at the massive Javits Center on Manhattan's west side, draws enthusiasts who love to dress up as their favorite characters and mingle with like-minded fans. The popular event sells out quickly. The Village Halloween Parade is a long-running tradition for New Yorkers and visitors alike. The parade route runs down from Chelsea before ending in Greenwich Village. November is the kick-off to the holiday season in New York. Temperatures are steadily dropping, and weather can sometimes be iffy—a freak early snowstorm isn't an impossibility—but the festive cheer is hard to beat. The Macy's Thanksgiving Day Parade parades goofy, fun, spooky, and dramatic floats of all shapes and sizes through Manhattan. It can be tricky to get a spot to see the show in person, but it's always aired on television. The New City Marathon is held on the first Sunday of November. The 26.2-mile race takes more than 50,000 runners on a tour of all five of New York's boroughs. There are few places more joy-inducing than New York City at Christmas! From department store windows to the bedazzled Rockefeller Center tree, New York at Christmas is a must-see. The Radio City Christmas Spectacular is a long-running performance of dance and theatrics that will thrill both adults and kids alike. New Year's Eve in New York City is the world's largest celebration, as revelers flock to Times Square to watch the famed ball drop at the stroke of midnight.